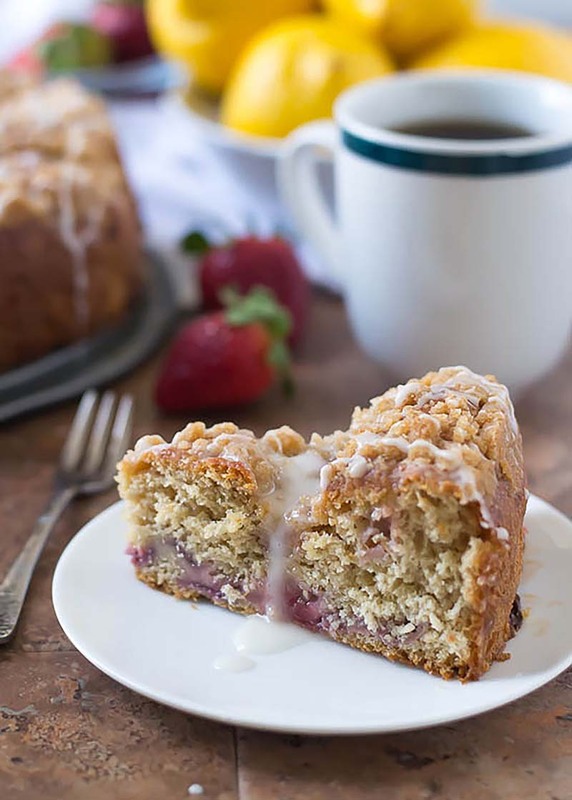 An easy, ultra moist coffee cake with fresh strawberries, streusel crumb topping, and fresh lemon glaze. Spray a 10-inch spring form pan with nonstick spray. In the bowl of a stand mixer fitted with the paddle attachment or a large mixing bowl, combine 1¼ cups flour, yeast, sugar, salt, lemon zest, and salt. In a microwave safe measuring cup, combine milk, water, and butter and heat until the liquid reaches 120-130°F. The butter may not melt completely. Add the warm liquid to the flour mixture, then mix the batter on low speed until combined. Beat in egg, then increase the speed to medium and beat 3 minutes. By hand, gradually stir in remaining the 1¼ cups flour and strawberries. Pour batter into prepared pan and spread as evenly as possible. Cover with plastic wrap that is lightly misted with cooking spray, then let rise in a warm place until nearly doubled in size (about 30 minutes). Place rack in the center of oven and preheat oven to 350°F. Prepare the topping: In a small bowl, stir together the granulated sugar, brown sugar, and flour. Pour the butter over the top, then with your fingers, quickly mix until crumbly. Set aside. Once dough has doubled, lightly flour your hands and softly pat dough out to edges of pan. Recover and let rest 5 minutes. Sprinkle dough with all of the crumb topping, bake for 30 minutes. Remove pan from oven, cover with aluminum foil, then bake an additional 10 minutes, until cake is golden and a toothpick inserted in the center comes out clean. Remove cake from oven and cool in pan on a wire rack for 10 minutes. Run a knife around the edge of the cake, then remove the ring. While the cake bakes, prepare the glaze: Sift the powdered sugar into a small bowl, then whisk in 2 tablespoons lemon juice until smooth, adding slightly more lemon juice as needed to create a thin glaze. Drizzle over cake, then serve.